Northern hospitality for the Florida predatory stink bug, Euthyrhynchus floridanus, and wax scales, Ceroplastes spp. This resident of Florida, a predatory stink bug, was observed chillin’ on the bark of an elm tree in College Park last week. With record hear throughout much of the nation this year, even naysayers have conceded that our planet appears to be warming. One of the interesting biological consequences of climate change is the expansion of the ranges of warm-weather insects to cooler regions where chilly winter temperatures formerly barred their survival. Recently, Bug of the Week received two reminders of our warming weather in the mid-Atlantic region. 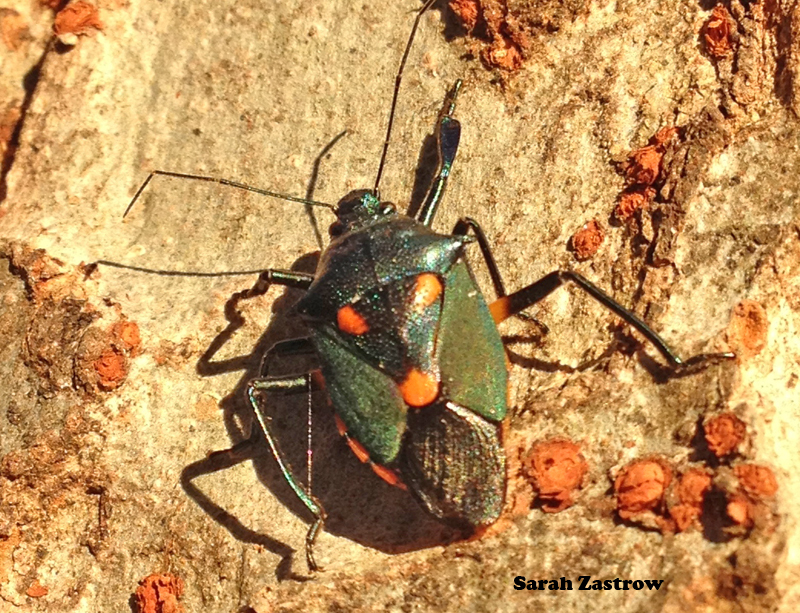 During a recent safari to the University of Maryland campus, one eagle-eyed entomologist, Sarah Zadtrow, discovered a Florida resident, the predatory stink bug Euthyrhynchus floridanus enjoying a sunny afternoon as it rested on the bark of an elm tree. Like other predatory bugs visited in previous episodes of Bug of the Week (see Heroes of the True Bug Clan), Euthyrhynchus dines on a wide variety of soft-bodied insects including caterpillars, beetle larvae, and other less fortunate stink bugs. This was actually the second report of Euthyrhynchus floridanus in Maryland this year. The first appearance was noted by Maryland extension specialist Stanton Gill in late October. To my knowledge, these may be the northern-most sightings of this semi-tropical resident. It has also been recorded in coastal Virginia according to Eric Day, Virginia Tech’s diagnostic guru. 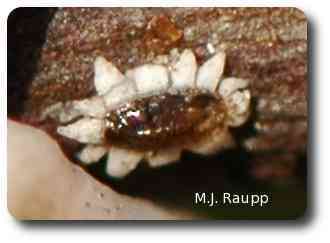 Beneath the white waxy glob is the small reddish scale insect. While dining out this week, I was impressed by a landscape bed heavily planted with roses and inkberries. Branches of several plants were festooned with small white globs of what appeared to be wax. 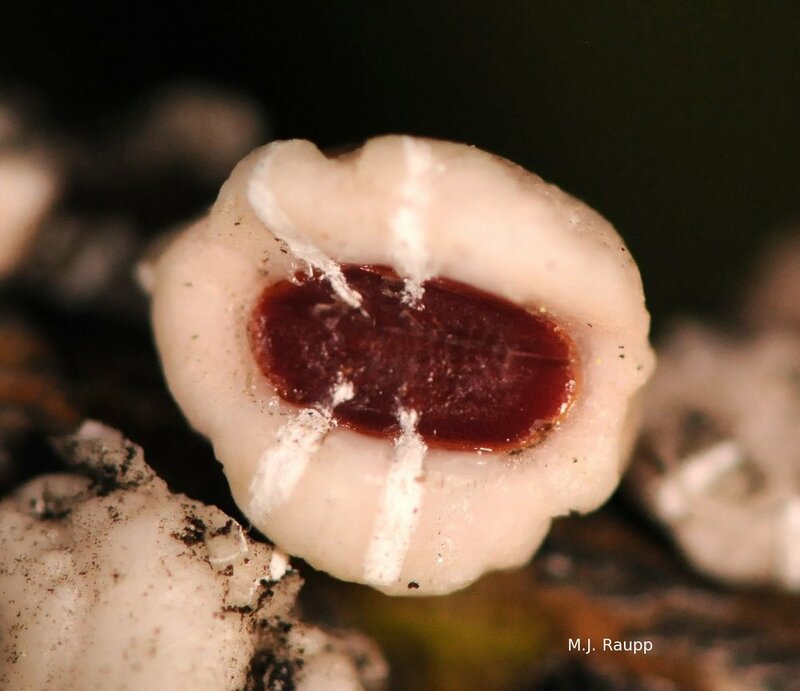 These insidious invaders, wax scales, are regular perennial pests of many trees and shrubs found in southern states where mild temperatures suit their life style. In recent years with warmer winters further north, we have seen many southern pests creep into higher latitudes. Although it is not unusual to find wax scales as occasional visitors in Maryland's landscapes, they have become regular guests in our region and it is increasingly common to see hollies and many other landscape plants, including roses, boxwoods, firethorns, spirea, and quinces heavily infested. Hence, wax scales are waxing indeed! For obvious reasons, young scales are called cameos. The larger wax scales are adults capable of surviving winter on the bark of a tree. In spring with the return of warmer weather and the flow of sap in their host, these largely sessile creatures will resume feeding and begin to lay eggs, as many as a thousand each. In the wild, male wax scales of some species have not been observed. Females have found a way to bypass the romance and get straight to the business of laying eggs. This interesting reproductive strategy, called parthenogenesis, is fairly common in insects. The eggs hatch and tiny mobile crawlers move along branches to find new places to hunker down, insert their long sucking mouthparts into the bark of the tree, and imbibe nutritious sap. They soon produce a small ring of wax around their bodies, which closely resembles Victorian jewelry and has earned them the name "cameos." To acquire sufficient nutrients from the sap requires a great deal of sucking and excess food is eliminated in the form of sweet, sticky liquid called honeydew. We met other honeydew producers like aphids and tulip tree scales in previous episodes of Bug of the Week. The honeydew accumulates on bark and leaves and serves as a substrate for the growth of a fungus called sooty mold. Sooty mold is a sure sign of a honeydew producer. Sooty mold does not harm the holly directly, that is, it causes no disease. However, some people find the grimy substance disagreeable and one can imaging that enough sooty mold might cut down on the plant's ability to gather energy from sunlight. For bug geeks though, sooty mold is a sure sign of the presence of a potentially glorious insect and a signal to intensify the search. When abundant, wax scales can really set your plants back. If you find wax scales on your shrubs or trees, and deem them problematic, one easy solution is to simply pluck them off and toss them to the ground. On the soil, they will be consumed by a ravenous horde of ground dwelling meat eaters. Destruction of wax scales is easily accomplished during the fall and winter when deciduous plants are devoid of leaves and the scales are large and apparent. In spring, after thousands of eggs hatch, the task of destroying scales is more complicated and the use of systemic insecticides may be warranted. In the meantime, as the world warms up, don't be surprised to her more reports of southern insects moving north to enjoy a little northern hospitality. Bug of the Week thanks Sarah Zastrow, Stan Gill, and Eric Day for providing the inspiration for this episode. 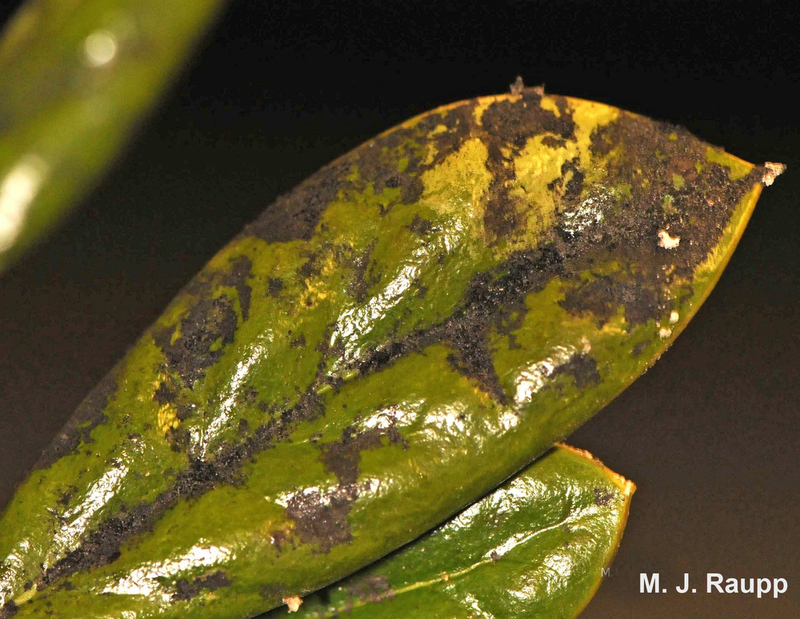 "Managing Insect and Mite Pests on Woody Plants" by John Davidson and Michael Raupp was used to prepare this episode.